Located in Bald Rock National Park, 33 kilometres north of Tenterfield, Bald Rock is Australia's largest exposed granite surface. Known as an inselberg, or isolated rock hill, Bald Rock towers approximately 200 metres above the surrounding bushland, is 750m long, 500m wide and rises to 1,277m above sea level. The 'adamellite' granite which forms Bald Rock was created some 247 million years ago when a dome of molten magma from the earth's mantle pushed up under the existing metamorphic and sedimentary rock then cooled to form adamellite. 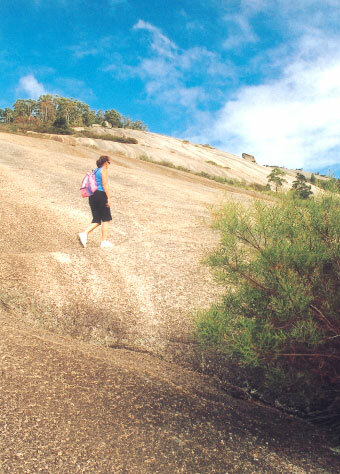 Subsequent uplift and erosion has removed the softer surrounding sediments and metamorphic rocks, with Bald Rock remaining as a result of the adamellite granite's resistance to weathering. 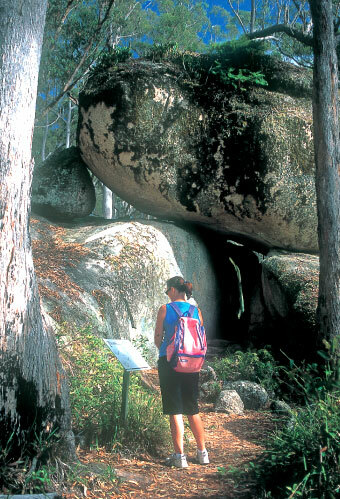 The region surrounding Bald Rock also boasts many similar formations such as spectacular granite domes, tors and balancing rocks comprised mainly of a type of granite known as Stanthorpe Adamellite. An invigorating climb via one of the two marked walking tracks is rewarded by expansive views across the beautiful granite landscape. The summit walk is a round trip which takes approximately 3hrs. Rubber-soled shoes should be worn to increase traction as the rock is steep in sections and make sure you carry water as it is quite a climb to the top. On the return trip you may descend to the base by following a marked track traversing the rock face but it is very steep and should only be tackled by those with good ankles. 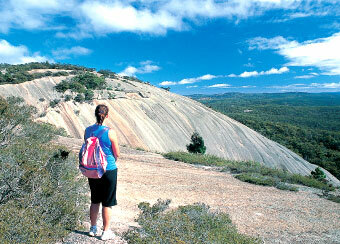 Bald Rock National Park is ideal for bushwalking and camping with facilities including toilets, BBQs and picnic tables. Entry fees apply. And as expected in natural areas, the entire area is home to an abundance of wildlife which includes venomous snakes. Keep a sharp eye out for them: if you do see a snake avoid it, particularly on hot days when they are more active. To get to Bald Rock from Tenterfield turn right at the northern end of Tenterfield into the signposted Woodenbong Road. Follow it north through grazing lands and forest, passing the turnoffs to Basket Swamp and Boonoo Boonoo national parks. The road crosses over the Boonoo Boonoo River and Carrolls Creek, and you'll see a sign at the junction of the Woodenbong Road and the park access road directing you into Bald Rock. Follow the paved access road for 5km to the picnic and camping areas.